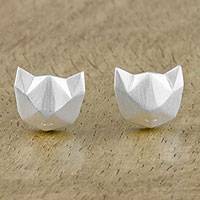 Size: 0.2" H x 0.3" Diam. Well crafted, detailed design. 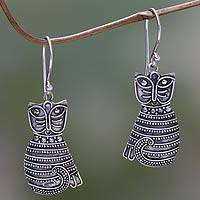 Light and comfortable to wear, as well as pretty and ornate sterling silver earrings. 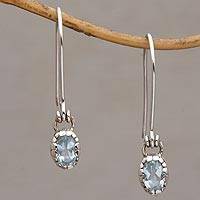 Beautifully crafted earrings with sky blue sparkle. Love the puppy paws surrounding the topaz stone, and the unique way the stone attaches to the wire. 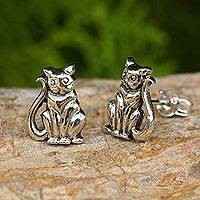 Terrific quality! 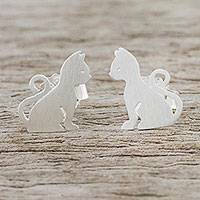 Perfect Gift for Cat Lovers! 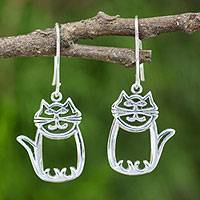 If you love cats or have a friend who does, these earrings will make a great gift! I really enjoy wearing them, especially on weekends. 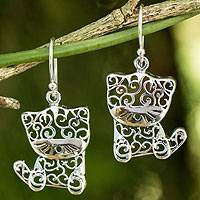 Sterling Silver Dangle Feline Earrings, "Balinese Cat"
Cute Sterling Silver Cat Dangle Earrings from Thai Artisan, "Whimsical Cat"
Garnet and Sterling Silver Dangle Earrings from Bali, "Teardrop Paws"
Sterling Silver Cat Earrings, "Filigree Kitten"